OBJECTIVE: Embryo quality declines with age due to dysfunction of mitochondria and intracellular organelles and increases in DNA damage induced by accumulation of oxidative stress and chronic inflammation. 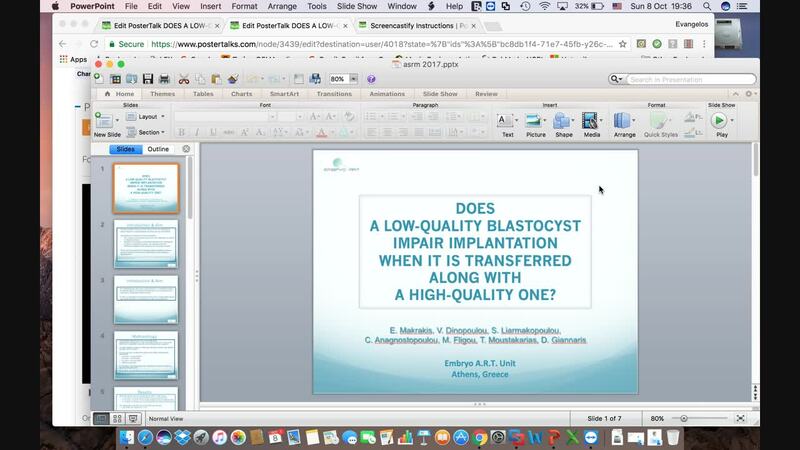 Such embryos have a low potential to implant and exhibit high proportion of miscarriage, even if the embryos showed good morphology. Despite many attempts, there is no established method to improve pregnancy rates in aging women. We investigated differential cell signaling related to aging-associated decline of embryo quality. DESIGN: Laboratory-based observational study sampled surplus human blastocysts with same morphological grading from IVF patients in two different age groups: young: 25-27 years of age (n=3) and aging: 39-45 years of age (n=5), together with preimplantation embryos and serum samples from young and aging mice. MATERIALS AND METHODS: Human blastocysts were subjected to DNA microarray analyses to identify cell signaling factors associated with aging-induced decline in embryo implantation success. Mouse zygote cultures following blastocyst transfer were performed to assess the roles of candidate factors following treatment with candidate ligands, neutralizing antibodies to the ligand, and specific receptor antagonists. The expression of candidate factors and their cognate receptors were measured using real-time RT-qPCR. Serum levels of candidate factors were determined by ELISA. RESULTS: In aging human blastocysts, 3,789 genes showed >5-fold increases as compared with young group. Among these genes, C-X-C motif chemokine 5 (CXCL5) showed 203-fold increases in aging embryos. In mouse embryos, the expression of CXCL5 was also increased during aging, whereas the expression of its cognate receptor, CXCR2 showed no change. The expressions of both CXCL5 and CXCR2 were low in aging oviducts and uterus. However, serum CXCL5 expression levels was increased 1.7-fold in aging mice, suggesting that CXCL5 could act on embryos via autocrine and paracrine manner in vivo. 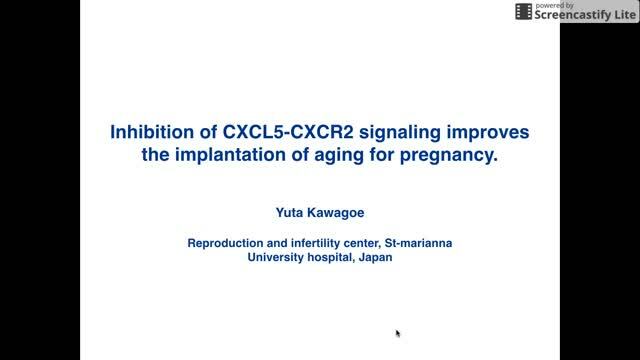 Although inhibition of CXCL5-CXCR2 signaling of aging mouse zygotic stage embryos up to the blastocyst stage did not affect embryo development judged by morphological evaluation, it significantly improved pregnancy success (control: 40.0±14.1%, treatment: 82.1±10.8%, P<0.01). Conversely, treatment of young mouse zygotic stage embryos with CXCL5 peptide significantly decreased pregnancy success (control: 83.9±4.5%, treatment: 34.4±9.7%, P<0.01), together with increases in aging markers in CXCL5 treated blastocysts. CONCLUSIONS: Results presented here are consistent with chronic inflammation as one of the major causes of embryo aging and support a role of CXCL5-CXCR2 signaling in preimplantation embryos, providing new clues for pharmacological manipulation of aging embryos during culture and assessing embryo quality based on CXCL5 as an aging biomarker.